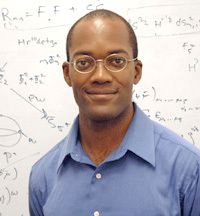 Clifford Johnson's research interests are mainly concerned with the development of theoretical tools for the description of the basic fabric of Nature. He is part of the international effort to understand and describe the origin of, and the fundamental constituents (and their interactions) of the Universe. He works mainly on superstring theory, quantum gravity, gauge theory, and M-theory, studying objects such as black holes and D-branes, using a variety of techniques from Mathematics and Physics.